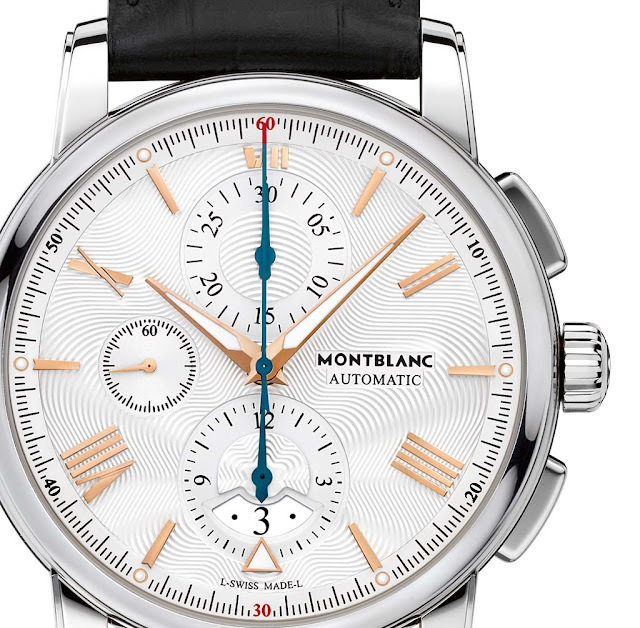 Each timepiece in the 4810 Collection introduced in 2016 by Montblanc follows the typical design codes of the Maison with guilloché dials featuring the signature star motif, red gold Roman numerals and indexes, larger and bolder cases, and regate-shaped and skeleton hands. The 4810 Chronograph Automatic timepiece makes no exception with its bold 43 mm stainless steel case and elegantly decorated dial. 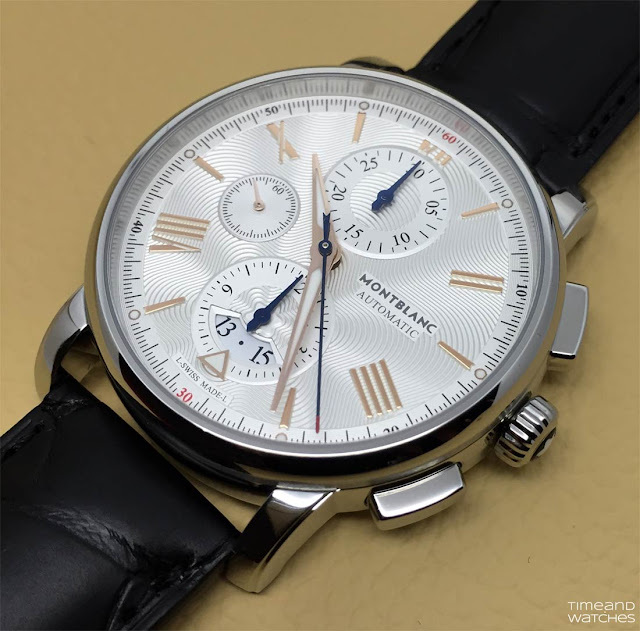 This integrated two-pusher chronograph indicates central hours and minutes, seconds in a subdial at 9 o’clock, date in a subdial at 6 o’clock with a triangle indicator, chronograph seconds hand in the centre, 30-minute chronograph counter at 12 o’clock and hour chronograph counter at 6 o’clock. 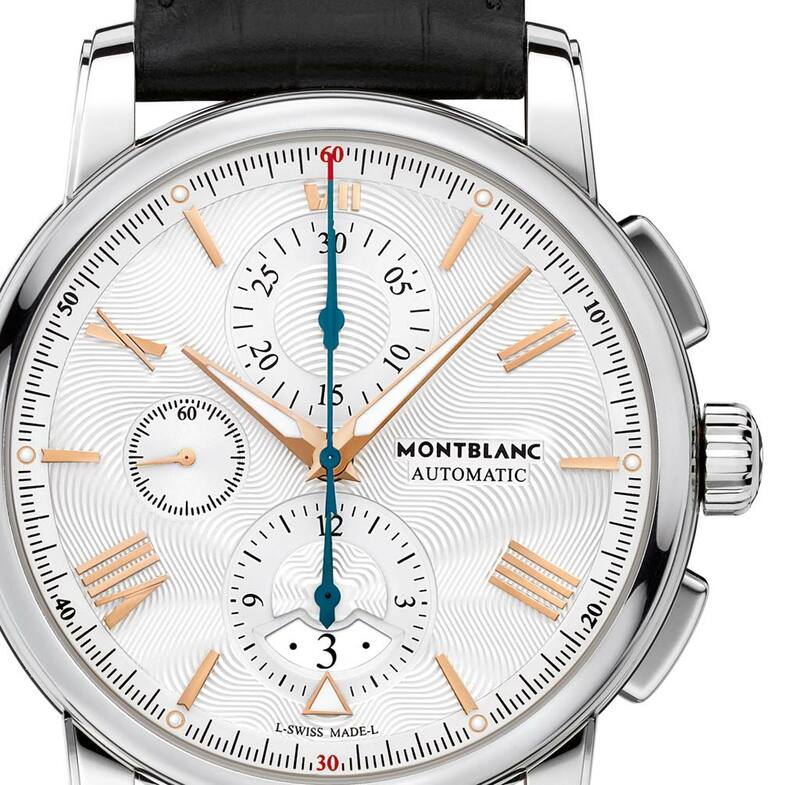 date triangle — have been crafted out of red gold, while the chronograph hands are all in blue, with a red-tipped blue hand for the central chronograph seconds hand. The minute track also includes a red "30" and "60" for improved readability during the day. Thanks to Super-LumiNova enhanced hour and minute hands and Super-LumiNova dots on the minute track and on the date triangle, accurate reading is possible even at night or in poor light conditions. 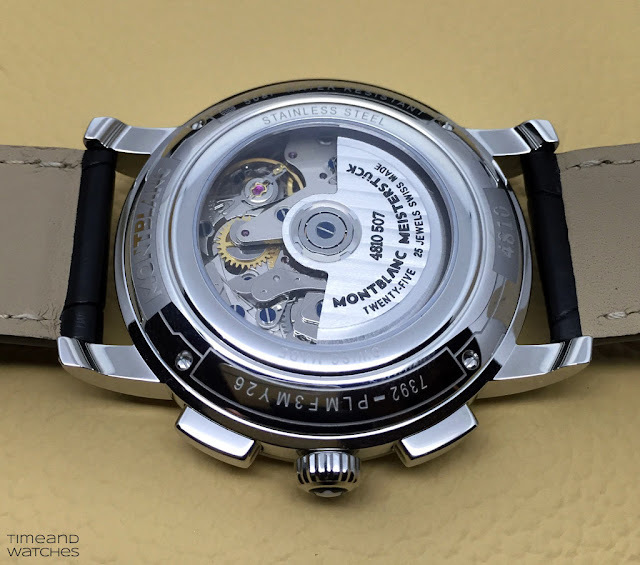 This 4810 model is powered by Montblanc’s self-winding MB 25.07 calibre beating at 28,800 vibrations per hour and offering a 46-hour power reserve. Montblanc 4810 Chronograph Automatic; Each timepiece in the 4810 Collection introduced in 2016 by Montblanc follows the typical design codes of the Maison with guilloché dials featuring the signature star motif, red gold Roman numerals and indexes, larger and bolder cases, and regate-shaped and skeleton hands. The 4810 Chronograph Automatic timepiece makes no exception with its bold 43 mm stainless steel case and elegantly decorated dial. 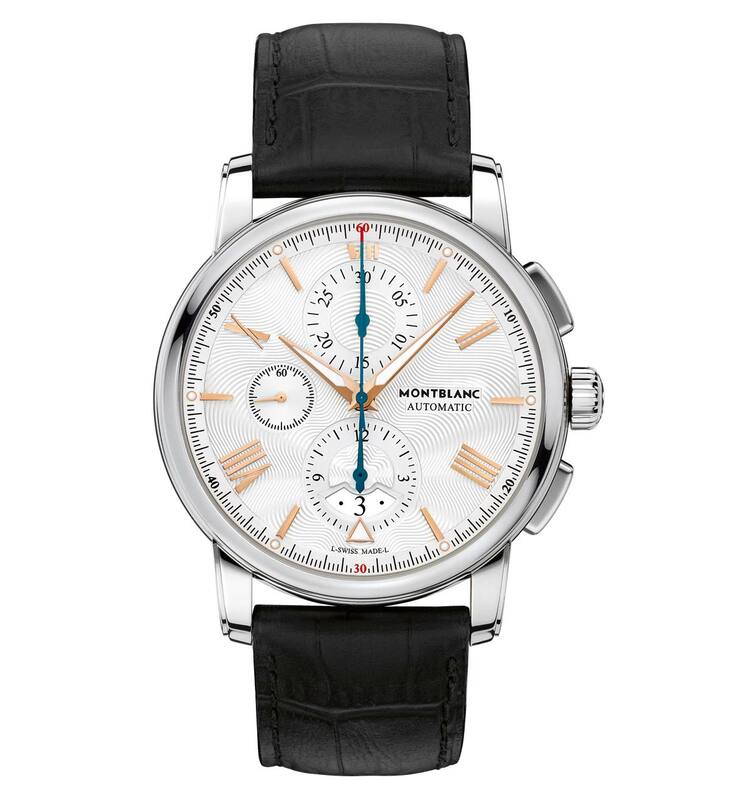 The Montblanc 4810 Chronograph Automatic (Ref. 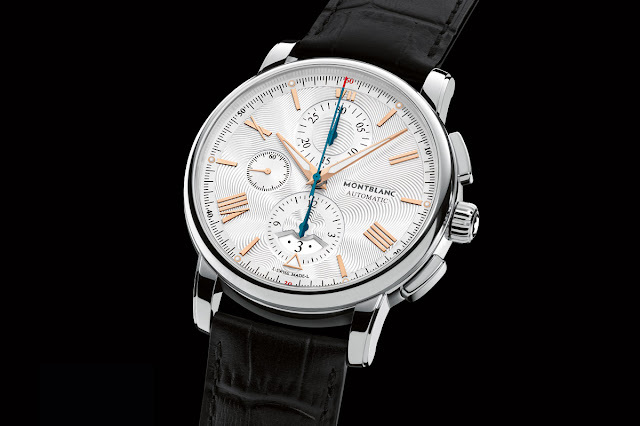 114855) has a retail price of Euro 4,000 / US$ 3,985.